Dubai, UAE – Titled "Gulf Health: A Modern History," Royal Philips (NYSE: PHG, AEX: PHIA) and the Economist Intelligence Unit will showcase an illustrated story of the deterioration of health across the GCC due to sedentary lifestyles and poor dietary habits at Arab Health 2015. 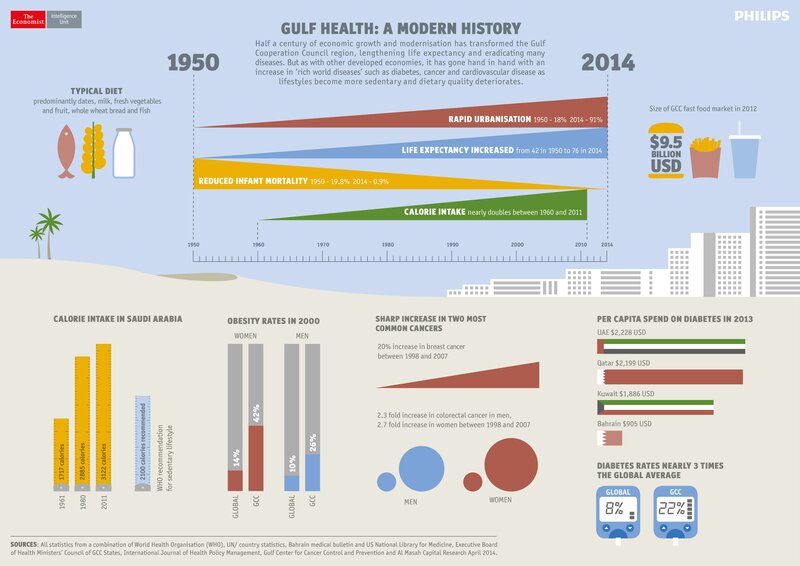 While economic growth and modernization have transformed the GCC region by lengthening life expectancy and eradicating many diseases, a closer look at trends presented in this new infographic confirm a correlation to the increase in non-communicable diseases such as diabetes, cancer and cardiovascular diseases. Over the last 50 years, urbanization has rapidly increased by over 70 percent. With modernization, life expectancy is now 76 years, in comparison to 42 years of age in 1950, while infant mortality rates have dramatically dropped to 0.9 percent from 19.8 percent a half century ago. However, with this change come concerns. In Saudi Arabia, caloric intake in the last decade has increased to 3122 calories per day; an extra 1000 calories more than recommended by the World Health Organization. In 2012 alone, the GCC fast food market was valued at $9.5 billion USD. Rates of obesity and diabetes in the GCC are above global averages. Figures show 42 percent of GCC women are obese, compared to 14 percent of women across the globe, while 22 percent of the population suffers from diabetes, compared to the global average of only eight percent. The per capita spend on diabetes remain high with UAE and Qatar being the highest at 2,228USD and 2,199USD respectively. Statistics also showed that there has been a sharp increase in two of the most common cancers. Facts show that, between 1998 and 2007, there was a 20 percent increase in breast cancer in women, and colorectal cancer increased 2.3 fold in men . "While this story may show us that lifestyle changes associated with modernization and urbanization have attributed to the increase in certain diseases, we are determined to deliver meaningful innovations across the health continuum to empower people to live healthier lives, and helping providers make better informed decisions for their patients," said Reinier Schlatmann, General Manager, Gulf Region, Philips Healthcare Middle East & Turkey. In addition, Philips is encouraging residents and visitors across Dubai to make a pledge to achieve their goal for 2015, inviting visitors to JBR and Arab Health 2015 to pledge for a healthier lifestyle, using the #myhealth2015 and #arabhealth at the Philips Arab Health Booth from 26th – 29th January and the Philips Innovation Beach House, situated at The Beach opposite JBR from 22nd – 31st January. Ten pledging winners will receive life, fitness or nutritional coaching along with Philips solutions to help them achieve their goals. Royal Philips (NYSE: PHG, AEX: PHIA) is a diversified health and well-being company, focused on improving people’s lives through meaningful innovation in the areas of Healthcare, Consumer Lifestyle and Lighting. Headquartered in the Netherlands, Philips posted 2013 sales of EUR 23.3 billion and employs approximately 115,000 employees with sales and services in more than 100 countries. The company is a leader in cardiac care, acute care and home healthcare, energy efficient lighting solutions and new lighting applications, as well as male shaving and grooming and oral healthcare. News from Philips is located at www.philips.com/newscenter .